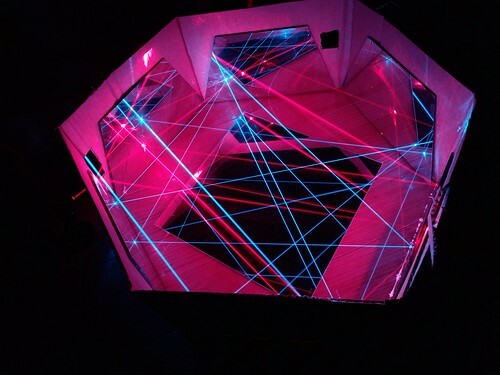 Cardboard, 1st surface mirrors, a few bathroom mirrors...and LASERS. Most are the 490nm and a Mitsubishi 826. 505nm tossed in there for 1. Yeah, that was an intuitive way to make some beam shots. Didn't have enough first surface mirrors to do it all with them? You'll get those double reflections with regular mirrors. They look brilliant LewDude. Now you know what will look even better. 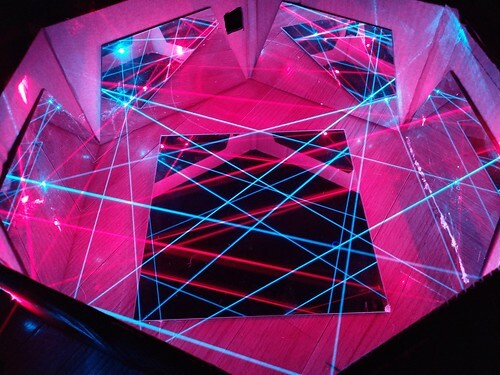 More lasers and more mirrors. 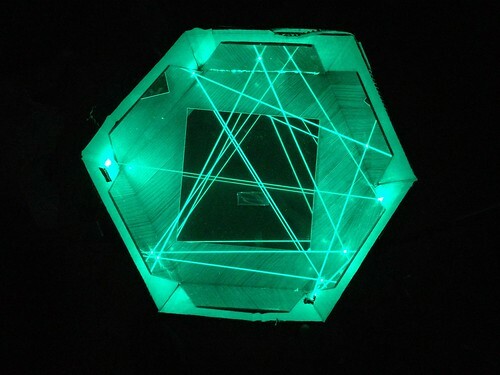 All the mirrors around the hexagon are 1st-surface; the mirror(s) on the floor are not. I scored a lot of 'damaged' mirrors from projection TVs that I've used to make some smaller mirrors from and/or these kinds of setups. HA! 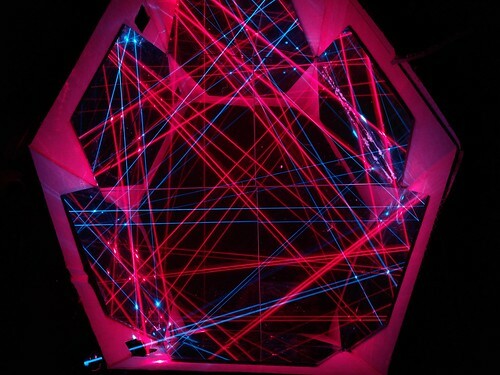 A couple of these were starting to get crowded with beams...but I like your thinking... when it comes to just about anything in life: moar LASERS, moar MIRRORs !! Thanks for the kind words! You know I had forgotten about those projection TV mirrors. They had a very large mirror for all three CRTs. I don't know where I would find one these days. 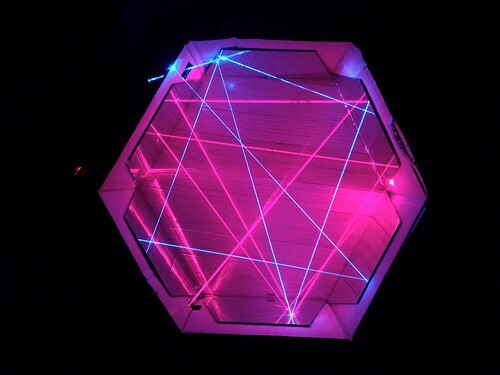 Pretty cool visual effect, looks a bit like those (totally fake) laser security systems from the movies where people have to clamber around avoiding breaking the beams etc. More great photos and video, very unique set-up! I've also got some of those first surface mirrors that were salvaged from old rear projection tv's, you can't beat the price! I've cut it into 4 or 5 large rectangular pieces for laser photos, but have yet to use them. There was a time I could have had all I wanted just for the taking. Also those large lenses bolted to the CRTs. 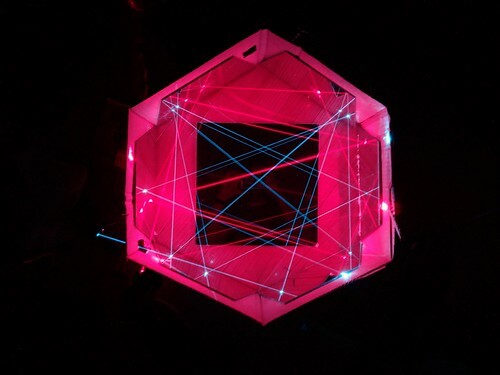 I wasn't doing anything with lasers back then except for holography. Sure would like to get my hands on just one junked out projection TV now. Yep, not as many around as there used to be, I got mine from an old member (starlight) who was giving them away, and didn't live too far from me, which allowed me to pick it up. That thing was a monster, big and awkward, and not very thick; I was afraid the mirror was going to break every time I hit a bump in the road. Naw, those mirrors were reinforced. I doubt you could break it if the projector fell off the truck. I have had countless ones apart. Used to change out CRTs all the time. Had to change the cooling fluid often as it would get so hot it would get dark brown particulates in it. They were a blast to converge.